Real-time PCR is the only purely PCR-based method of mutation detection, in that it does not require any adjunctive technique, such as electrophoresis. 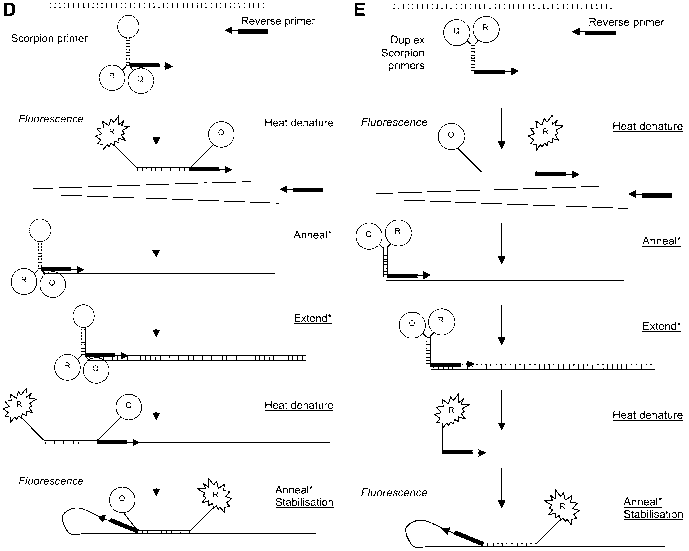 As is described in this section, the PCR is directly monitored within the reaction tube and the PCR primers themselves are designed to be specific for a particular sequence or sequences. Thus, real-time PCR is only of use in detecting previously described mutations found by some other technique. In real-time PCR, the exponential phase of PCR is monitored as it occurs, using fluorescently labeled molecules (1). During the exponential phase, the amount of PCR amplicon DNA present in the reaction tube is directly proportional to the amount of starting material specific to the PCR primer pair (or target sequence). Thus, the amount of emitted fluorescence is directly proportional to the amount of amplicon, which, in turn, is proportional to the starting amount of target sequence (2,3). If required, this can then be used to measure the target copy number. Real-time PCR needs to be distinguished from reverse tran-scription-PCR (RT-PCR), although, for example, RT-PCR can be used in conjunction with real-time PCR to measure gene expression as well as test for mutations (4,5). There are two types of real-time PCR: that which uses nonspecific DNA binding dyes such as ethidium bromide or SYBR green I and that which uses labeled probes. 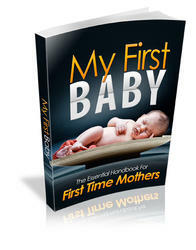 These are discussed in the following subsections. 2.1. REAL-TIME PCR: NONSPECIFIC DNA-BINDING DYES Nonspecific DNA binding dyes simply allow the determination of the presence or absence of an amplicon, without giving any information regarding the precise nature of the product. SYBR Green I is a dye that emits fluorescence when it is bound to double-stranded DNA. As the PCR proceeds and the copy number of the product increases, the amount of intercalated SYBR Green I will also increase, raising the level of emitted fluorescence in direct proportion to the copy number (6). Most applications of real-time PCR have been to measure gene expression or detect pathogens, although there are applications specific to medical genetics (7-10). 2.2. REAL-TIME PCR: LABELED PROBES There are three main kinds of labeled probe for use in real-time PCR: Cleavage (5' exonuclease) based, molecular beacons, and FRET probes (Fig. 1). Fig. 1. Sequence-specific real-time PCR methods. (A) Cleavage (5' exonuclease)-based assay: Light emission from the reporter fluorophore (R) is quenched because of its proximity to the quencher (Q). Cleavage by Taq polymerase separates the reporter and quencher allowing fluorescence. (B) Molecular beacons: Light emission from the reporter fluorophore (R) is quenched because of its proximity to the quencher (Q), brought about by the self-complementary 5' and 3' ends of the molecular beacon, causing it to take up a hairpin loop structure. Thermal denat-uration and annealing allows the central loop section of the molecular beacon to bind to its target sequence in the PCR amplicon. Thus, the reporter and quencher become sufficiently separated to allow fluorescence. In this system, the probe is not subject to cleavage by Taq polymerase. 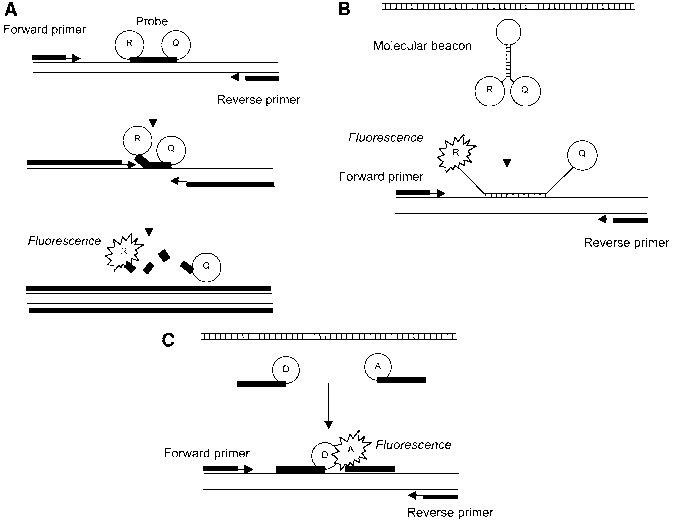 (C) Fluorescence resonance energy transfer (FRET) probes: The acceptor flurophore (A) is unable to floresce until it is within 1-5 bp of the donor fluorophore (D), which occurs when the two FRET probes anneal to the specific PCR amplicon. (D) Scorpion primers: Light emission from the reporter fluorophore (R) of the Scorpion primer is quenched because of its proximity to the quencher (Q), brought about by the self-complementary of the stem sections, causing it to take up a hairpin loop structure. 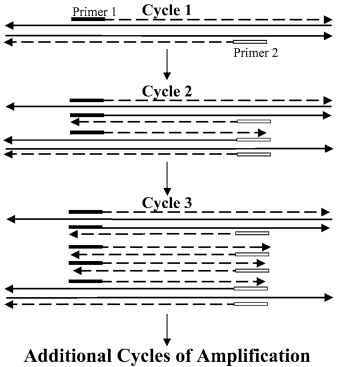 Thermal denaturation, annealing, and polymerase extension allows the central loop section of the Scorpion primer to bind to its target sequence in the PCR amplicon, thus stabilizing separation of the quencher and fluorescence. Thus, the reporter and quencher become sufficiently separated to allow fluorescence. In this system, the probe is not subject to cleavage by Taq polymerase. *Reverse primer and target DNA strand omitted for clarity. (E) Duplex Scorpion primers: Light emission from the reporter fluorophore (R) is quenched because of its proximity to the quencher (Q), brought about by the complementarity of the two Scorpion primers; the probe primer has the flourophore attached (R). Thermal denaturation separates the two primers allowing fluorescence, but annealing brings them back together again, causing quenching. However, in subsequent cycles, annealing of the probe sequence to its intramolecular complement in the amplicon is favored over binding to the quencher primer. Thus, the reporter and quencher became sufficiently separated to allow fluorescence. In this system, the probe is not subject to cleavage by Taq polymerase. the 3' end. When the probe is intact, the proximity of the quencher reduces the fluorescence emitted by the reporter dye. During PCR, the forward primer is extended by the Taq DNA polymerase until it reaches the probe. At this point, the exonu-clease activity of the Taq DNA polymerase displaces and cuts up the probe, releasing the reporter dye and the quencher. Once they are no longer in close proximity, the reporter dye emits fluorescence of a particular wavelength that can be detected (11). fluorescence is emitted. Unlike in the cleavage-based assays, where fluorescence is detected during the elongation phase of PCR, with molecular beacons, fluorescence is detected during the annealing phase (14-16). 2.2.3. FRET Probes Förster or fluorescence resonance energy transfer (FRET) probes are two separate fluorescently labeled oligonucleotides, one with a 5' donor molecule and the other with a 3' acceptor molecule attached: one is specific for target (i.e., wild-type or mutant) and the other is common (Fig. 1C). Only when these are placed within 1-5 bp of each other can energy be transferred from the donor to the acceptor, which then emits fluorescence (17,18). 2.2.4. Scorpion Primers Scorpion primers are a form of molecular beacon, but unlike them, they act by a unimolecular rather than a bimolecular mechanism (Fig. 1D) (19-21). Such a unimolecular mechanism is both faster and more efficient than a bimolecular mechanism, and direct comparison with equivalent cleavage (TaqMan) and molecular beacon-based tests would suggest that Scorpion primers perform best. By combining two Scorpion probes in multiplex PCR, it is possible to probe for two mutations simultaneously. In its original form (Fig. 1D), a Scorpion primer has, from 5' to 3' the following: (1) a fluorophore at its 5' end; (2) a stem and loop oligonucleotide sequence, the loop part of which is complementary to a sequence within the PCR amplicon; (3) a quencher dye (e.g., methyl red); (4) a PCR stopper/blocker section (e.g., hexethylene glycol, to prevent extension of the opposite strand beyond this point); (5) a conventional target-specific oligonucleotide PCR primer section (22). After the initial PCR cycle, the loop section of the Scorpion probe is able to intramolecularly base-pair with its complementary sequence within the amplicon. The theoretical advantages of a Scorpion probe is that it is more specific, gives a stronger signal (improved signal-to-noise ratio), and acts faster than comparable molecular beacon or TaqMan probes. These theoretical advantages are borne out in practice. Another version of the Scorpion probe system is the duplex format, whereby two primers complementary to each other, one with a fluorophore and the other with a quencher, are used instead of a single stem-loop Scorpion probe (Fig. 1E) (23). Like stem-loop Scorpions, this format requires the complex synthesis of nonstandard oligonucleotides (22). However, the advantage of duplex Scorpions is that, like TaqMan probes, the quencher and fluorophore become completely separated during the process. This is unlike stem-loop Scorpions and molecular beacons, where some degree of Förster resonance energy transfer tends to quench the signal. The background is also theoretically lower compared with TaqMan probes because of higher quenching because of proximity of the fluorophore and quencher. This has led to the development of FRET duplex Scorpions (23). Duplex Scorpion probes are easier to synthesize compared with stem-loop Scorpions, but, nonetheless, their synthesis is more involved than that for standard fluorescently labeled oligonucleotides. So far, there have not been many medical applications of Scorpion probes have appeared, but those that have include analysis of known mutation detection in cystic fibrosis (CFTR/ABCC7), quantitation of human immunodeficiency virus (HIV)-1, and splice variant analysis of calpain 3 (21,23-26). Some interesting applications to plant pathogen and food science have been presented (27,28). 2.3. INFORMATION There is plenty of information on the Internet related to real-time PCR, in particular we would recommend the following: http://www.pcrlinks.com/ variants/real-time_pcr.htm, http://www.protocol-online.org/prot/ Molecular_Biology/PCR/Real-Time_PCR/, http://home. att.net/ ~dorak/genetics/realtime.html, and http://molecular-beacons.org/. 2.4. EQUIPMENT FOR REAL-TIME PCR Real-time-PCR is performed on thermal cyclers that have an integral optical system to detect fluorescence of different wavelengths. The optical system is connected to a computer with software that can analyze the fluorescence data to produce the exponential curves or allelic discrimination data required. 2.5. USES OF REAL-TIME PCR The main uses for realtime PCR in a molecular diagnostic laboratory are for single nucleotide polymorphism (SNP) genotype analysis and sequence copy number determination. For SNP genotyping and small mutation testing, two differently labeled probes are designed: one for the wild-type allele and one for the mutant allele. The mismatch between the wildtype allele and the mutant probe facilitate competitive hybridization. Therefore, fluorescence will only be detected when the correct probe binds the target sequence. This sort of assay can be utilized where specific mutations are being analyzed, such as in sickle cell disease or as part of a cystic fibrosis screen (11,14,17,18,20,23,29,30). Real-time PCR can also be used to determine the copy number of specific target sequences, such as the Peripheral Myelin Protein 22 gene (PMP22). By multiplexing the primers and probes for PMP22 with the primers and probes for a control sequence, known to be present in two copies, accurate measurement of the PMP22 copy number can be made. This determines whether a patient has one, two, or three copies of PMP22. Patients with only one copy of PMP22 have hereditary neuropathy with liability to pressure palsies (HNPP), whereas patients with three copies have Charcot-Marie-Tooth disease (CMT) (3,24-26,31-33). An interesting application of real-time PCR has been the detection of DNA methylation. Expression of the DNA mismatch repair enzyme MLH1 is lost in approx 20% of colon cancers and is associated with methylation of the gene's promoter. Other tests for methylation, dependent on cleavage at or binding of primers to single specific CpG sites do not necessarily give results representative of the global methylation status of single DNA molecules. However, a real-time PCR assay (MethyLight), in which all the primers involved (forward, reverse, and reporter) bind to sites containing at least three CpGs each, has been designed (34-36). Thus, the MethyLight assay only reports methylation when all of the CpG sites on a particular DNA molecule are methylated, which is likely to be more biologically relevant. Real-time PCR also has many other applications in the fields of clinical microbiology, food microbiology, tumor biology, gene therapy, and gene expression (4,27,28,37,38). 2.6. ADVANTAGES OF REAL-TIME PCR The main advantage of real-time PCR is the speed with which samples can be analyzed, as there are no post-PCR processing steps required. PCR can be performed in a 96- or 384-well format, and reactions can be multiplexed, leading to a high throughput of samples. The analysis of results is very simple and this contributes to it being a much faster and simpler method for analyzing gene copy number compared with many other current methods, such as multiplex amplifiable probe hybridization (MAPH), Southern blotting, and semiquantitative PCR (39). Another major advantage of having no post-PCR steps is that real-time PCR is a closed-tube method of analysis, which greatly reduces the chance of sample contamination, errors from mistakes in tube tranfers, or amplicons escaping into the laboratory environment; all important factors in the molecular diagnostics laboratory. 2.7. LIMITATIONS OF REAL-TIME PCR A major limitation of real-time PCR is the initial capital investment for equipment, as well as the investment required for staff training and expertise. Furthermore, real-time PCR probes are extremely expensive compared with conventional oligonucleotides. This underscores the fact that some of the personnel investment should be directed toward proper probe design. There are also technical limitations. When using nonspecific real-time PCR methods, such as with SYBR Green I, side-reaction products other than the desired amplicon (such as primer dimmers) are also detected. Careful optimization using melting-curve analysis is required to give a clear distinction between the correct amplicon and any unwanted PCR products. The inability to differentiate between specific and nonspecific products limits nonspecific real-time PCR to single amplicons; that is, the PCR cannot be multiplexed. Because there is a limited availability of fluorescent dye combinations, currently a maximum of four dyes can be used per reaction tube. This limits the extent to which multiplexing can be performed. A final limitation to be considered is that the quality and accuracy of the data produced are very dependent on the sample preparation and the quality of the DNA. Careful probe design and optimization are essential for good results to be obtained, particularly in SNP-based analyses. This means that careful planning and workup is required in order to set up a reliable and accurate assay. The inclusion of appropriate controls is mandatory. Fig. 2. The amplification refractory mutation system. 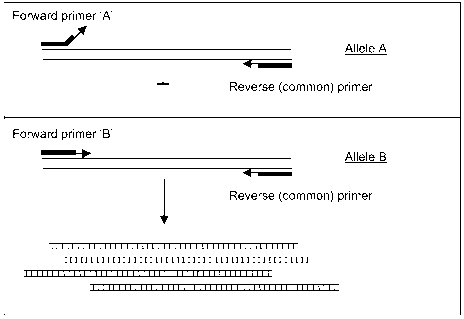 The forward primer is designed at its 3' end to match allele B, but not allele A. Thus, if allele B is present in the target DNA an amplicon will be produced in the PCR. A complementary ARMSPCR in which the forward primer is designed to match allele A, but not allele B, is also performed.